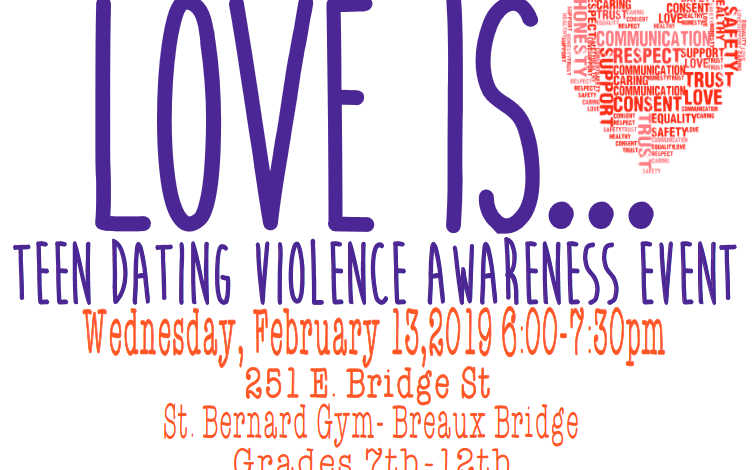 Chez Hope will hosts a teen dating violence awareness event February 13th from 6:00-7:30pm. The event is for all 7th-12th grade students and adults in St.Martin Parish to attend free of charge. February is Teen Dating Violence Awareness Month. With nearly 1.5 million high school students nationwide experiencing physical abuse form a dating partner in a single year, Chez Hope, aims to teach our students the importance of knowing their self worth and recognizing a healthy vs non healthy relationship and also provide a safe place for them to ask questions and talk about situations they may be going through. Once again the event is free and opened to whoever wants to come. We will be having a couple guest speakers, hands on activities for the students, food, and door prizes. The event will be held at St.Bernard Gym in Breaux Bridge, Louisiana.